Liberty Intl. - Charleston Intl. John F. Kennedy Intl. - Charleston Intl. NYC-All Airports - Charleston Intl. CHI-All Airports - Charleston Intl. Midway Intl. - Charleston Intl. O'Hare Intl. - Charleston Intl. The “clip-clap, clip-clap” of the stately filly’s feet on the weather-smoothed cobblestones serve as a soundtrack for your journey back in time. You ride, arm in arm with your better half, as the driver of your horse-drawn carriage points out one historical site after the next. Finally, you arrive at Boone Hall Plantation where you bid your steed adieu, and embark on a tour of an antebellum plantation with each step taking you further back into our nation’s history. Once you leave Boone Hall, you slowly return to modern-day Lowcountry where you can sample centuries’ worth of regional cuisine that will have your taste buds asking you why you don’t treat them to this amazing comfort food more often. 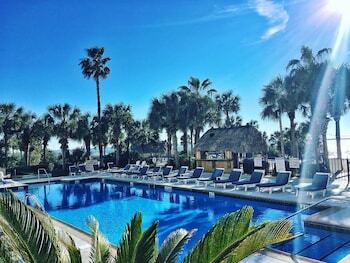 Planning a trip to Charleston, South Carolina? You're in good company. 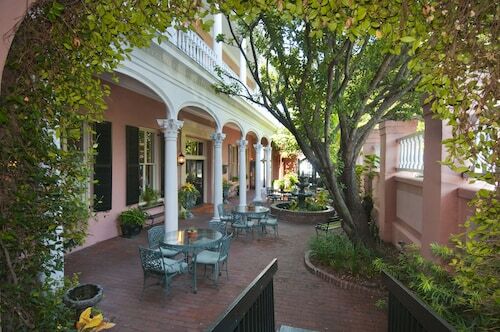 Charleston vacations rank among the most popular in the United States, for good reason. 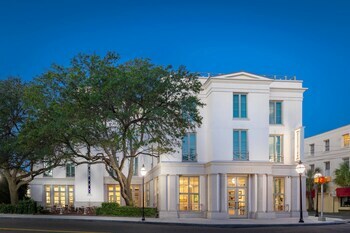 Affordable luxury hotels in Charleston are plentiful, historically significant sites abound, and miles of pristine beaches await. And, with the help of Travelocity, you can save a crab pot full of cash when you combine your travel with your accommodations. 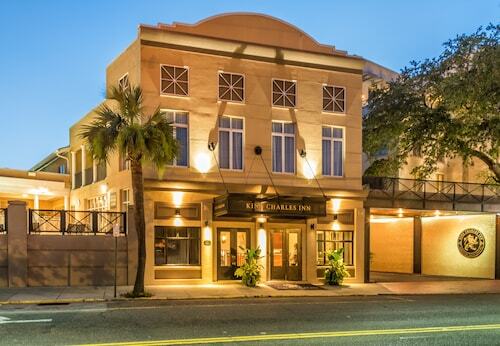 King Charles Inn : Located in the heart of the historic district, the luxurious King Charles blends in perfectly with its yesteryear neighbors. Guestrooms feature spa-inspired bath amenities, a Keurig coffee maker, and smartphone docking station. Fuel up for an afternoon on the cobblestones with lunch at the Brew Pub & Café, then cap off the day with a picturesque view of the sunset from the poolside deck. 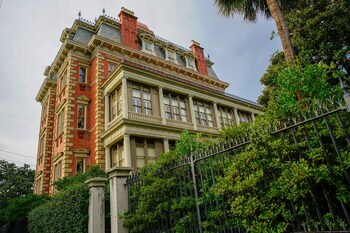 The Francis Marion Hotel: Situated across King Street from the aptly named Marion Square park, this historic property is an ideal venue for your vacation in Charleston. As the only high-rise hotel downtown, the views of the harbor from your room are unsurpassed. 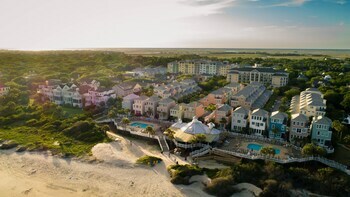 Enjoy a rejuvenating treatment from the on-site Spa Adagio, step outside the lobby door for a walking adventure in town, then return for an award-winning shrimp and grits dinner at the Swamp Fox Restaurant and Bar. 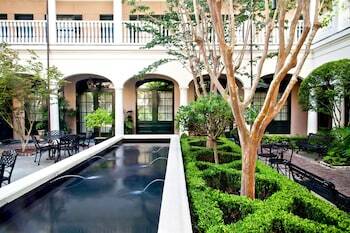 The Vendue: Just steps away from Waterfront Park and all downtown attractions, this Charleston French Quarter boutique hotel is more than just a conveniently located option. 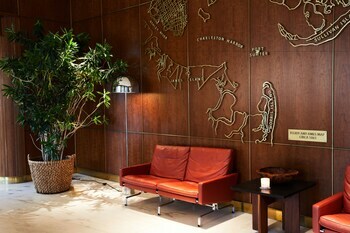 As the city’s only hotel dedicated to the arts, you’ll experience engaging works throughout the property. Your eyes aren’t the only thing in for a treat, either. 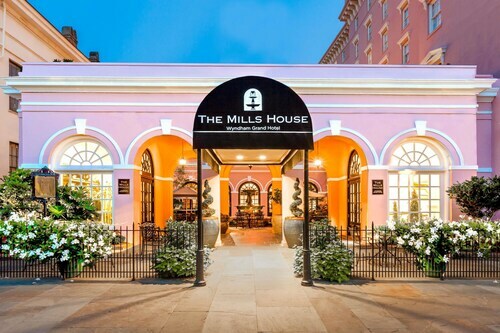 Grab breakfast and coffee at The Press, savor an amazing dinner at the Drawing Room, then finish the day with a cocktail at The Rooftop. 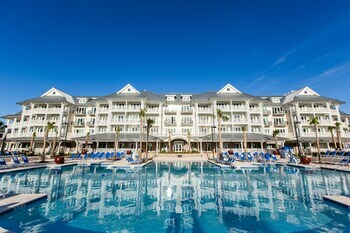 Charleston Marriott: Nestled next to Brittlebank Park on the banks of the Ashly River, the Marriott offers a modern high-rise alternative to the quaint historical hotels throughout town. The 50,000 square feet of flexible meeting space makes a perfect venue for your next event, Saffire Restaurant and Bar offers an eclectic mix of causal cuisine, and the rooftop Aqua Terrace lounge is the perfect place to watch the sunset over the Ashley. Whether you'll be renting a car in Charleston or you plan to rely on bikes, cabs, and hotel shuttles to get around, get ready to get going. There's so much to do and see, and, as a wise wanderer, you want to breathe it all in. A car will be handy when crossing the Arthur Ravenel Jr. Bridge to take in the stunning views. 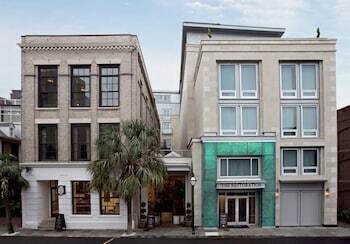 You won't need a vehicle to enjoy Charleston's historic district, considered one of the country's most architecturally significant neighborhoods. 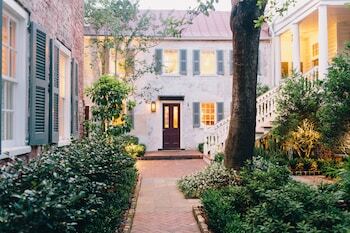 From cobblestone streets to colorful, genteel antebellum mansions, in Charleston you'll be surrounded by history. Be sure to hop a ferry to Fort Sumter and the Charles Towne Landing State Historic Site, and visit the gardens at Magnolia Plantation. And if you enjoy golf or tennis, be sure to schedule a tee-time at the country's first golf club or practice your backhand at the country's "Best Tennis Town." Any time is an excellent time to visit Charleston. If you play your cards right, you might experience one of the city's many seasonal events. Around Christmas, enjoy the annual holiday parade, Dickens Dinner, and Festival of Lights—all held in the shadow of the 270-year-old Drayton Hall plantation house. Around Halloween, consider taking a ghost tour…if you dare. In March, there's the Charleston Food and Wine Festival, and in late May, you can check out the 17-daylong Spoleto Arts Festival, packed with performances and visual arts. Ready to explore the year-round fun? 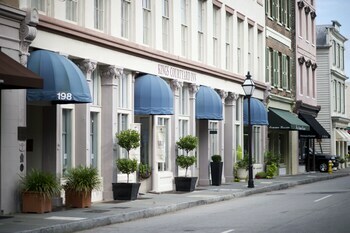 A Charleston, SC, vacation package from Travelocity is the way to go. 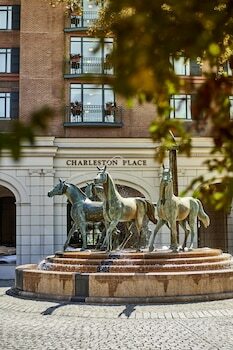 Charleston package deals bundle airfare and hotel to save you a significant amount of money compared to booking each separately. With the money you pocket, you can treat your entire party to a traditional Lowcountry feast featuring Frogmore stew, she-crab soup, a side of Hoppin’ John, and—of course—some of that delectable shrimp and grits. 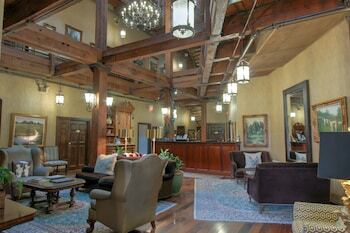 Situated in North Charleston, this hotel is within 1 mi (2 km) of CSU Medical Center and Northwoods Mall. Charleston Tanger Outlets and North Charleston Coliseum and Performing Arts Center are also within 6 mi (10 km). 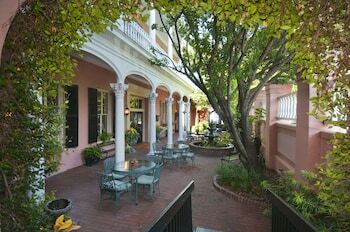 Located in Charleston Historic District, this romantic hotel is within a 5-minute walk of Gibbes Museum of Art and Charleston City Market. 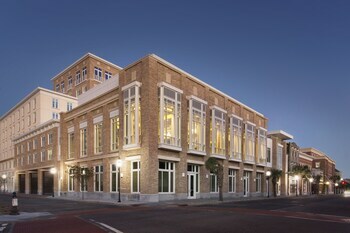 Waterfront Park and Port of Charleston Cruise Terminal are also within 10 minutes.